This cute puppy is Fubbs. 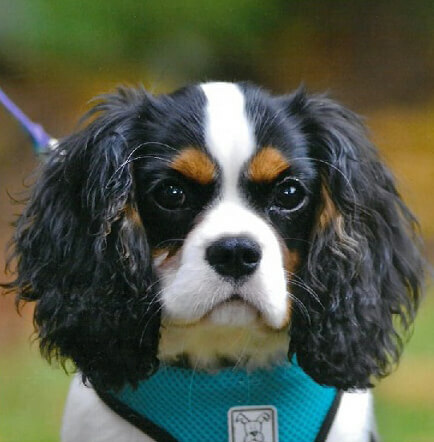 Fubbs is a 9 month old, Cavalier King Charles Spaniel who recently presented to Parkway for coughing episodes followed by random episodes of pain. His physical exam was consistent with back or neck pain and he was treated with pain medication and muscle relaxants to help with his discomfort. He continued to have pain and his owner was convinced he had something stuck in his throat. A recheck exam was still inconclusive but when offered food he would eat but then randomly cry out in pain. Fubbs was sedated and the problem was quickly identified – he had a sewing needle stuck in the back of his mouth near his throat! The needle was removed and Fubbs made a fully recovery. Due to his mothers vigilance, Fubbs is this months Pet of the Month.